This tribute to our beloved Fr. Paddy Heneghan as he was known locally is long overdue. Fr. Paddy never got used to his elevated title of ‘Canon’. When addressed as Canon he would brush it aside with an embarrassed smile “Just call me Paddy”, he would say. Fr Paddy was ordained on the 23rd of June 1963. 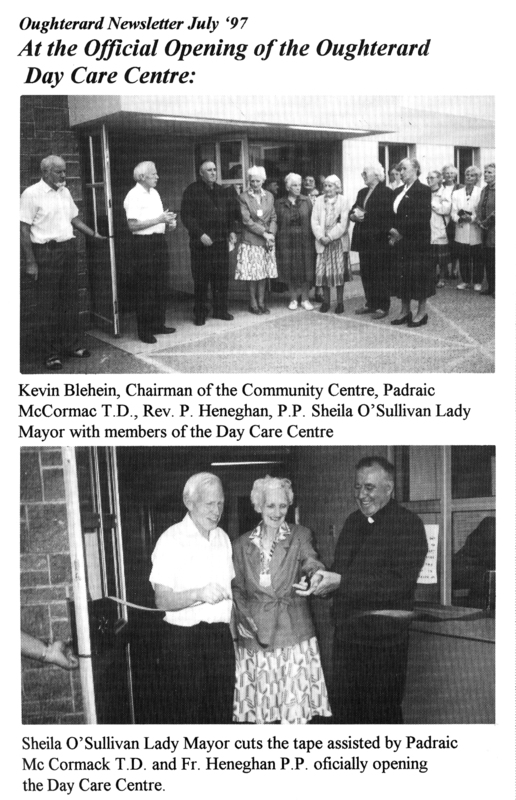 He served as Parish Priest of Oughterard from 1995-2008. Fr Paddy was a true shepherd of his flock. He cared for his parishioners in sickness and in health; he celebrated with them in the good times and mourned with them in their sorrow. He was a man of great wisdom who offered his advice and good council to all who sought it. Fr. Paddy was a native of Knockdoe. He received his early education at KnockdoeN.S. before attending St. Mary’s College. He hurled for St. Mary’s College, Turloughmore and MaynoothCollege. Clerical students at the time were away for nine months of the year and therefore were not involved in major county games so he never got an opportunity to show his skills at county level. Fr. Paddy was from a farming background. He never lost sight of his roots and had a great affinity with the farmer and working man. He treated everyone with great respect and dignity. He was calm in time of crisis, straight and honest. 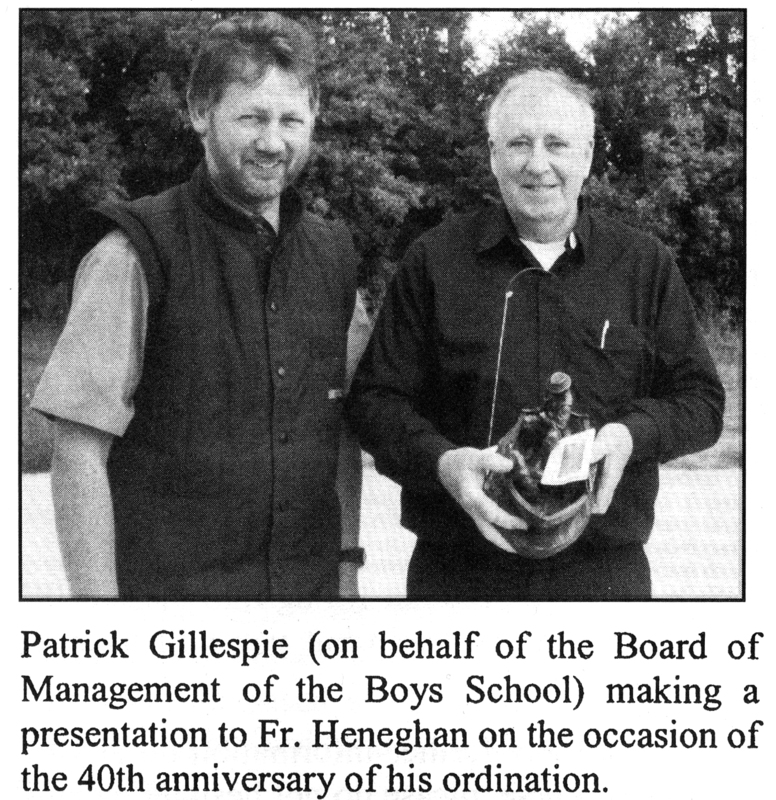 He was chairperson of the Board of Management of St Cuimin’s boy’s school and Scoil Muire, Derryglen. He had a great rapport with all children. The 5th and 6th class pupils of Derryglen interviewed him for their school magazine “Flashpoint” and I think it is worth printing it as it gives an insight into his character and the wonderful relationship that always existed between him and younger people. Q. After you joined the priesthood which parish was your favourite and why? A. My first parish was my favourite. It was Camus. I loved the young people who were very friendly and helpful. They taught me how to speak Irish in the school yard. The older children involved me in their games and took me fishing. I left part of my heart in Camus. Q. What are your three favourite pastimes? Q. What made you join the clergy? A. That is a difficult question. I felt it was a challenge to become a priest. An older priest asked me. I thought about it and made the effort and succeeded. I was influenced by visitors to our school. Brothers, priests and sisters came and invited us to join their orders. Teachers influenced me too. Once the President of St. Mary’s College asked me if I would become a priest. I said I would think about it. I wanted to get out to town. If I said “no” I would not get out or so I thought. Q. What sportsmen or sportswomen do you admire? A. The sportsman I admire most is Seán Purcell. I had the privilege to be with himself and his mother when she was dying. That was very special to me.Catriona Mc Kiernan: she has a beautiful personality. Q. Have you travelled the world much? A. Quite a bit, America, Middle East, Israel and the Lebanon. I was assistant chaplain in the army. The long term soldiers serving in the Middle East asked me to administer First Communion and First Confession to their children – expenses were covered by the United Nations. I had a chauffeur driven car from the United Nations for 22 days. I said Mass in Bethlehem where Jesus was born and I also said Mass at Calvary. I said Mass in Naim where Jesus raised the widow’s son to life. I remember the church was locked and after searching for about two hours an old man showed up with the keys. I had a great afternoon in Cana, where the Wedding Feast at Cana took place. I do not remember leaving there!! Q. Did you say Mass where Jesus was laid in the tomb? A. No I did not. Jesus was crucified a short distance from this spot and I said mass there. Q. How did you cope with the different languages? A. In the Middle East people speak English in one form or other, so I had no problem. Q. If it was your decision who would you appoint as President? Q. Did you ever feel nervous saying Mass? A. I have felt nervous at several Masses because I am a shy person. I am nervous in front of crowds. Q. If you are a shy person, how do you cope with being in the public eye? A. I have to put my shyness aside. You may not know it but Bishop Casey was a very shy man. He always needed someone by his side. He would want to know everything that was likely to happen so that he could be prepared. Q. What do you do in your spare time when you are not working? Q. When you were young, what was your favourite toy? A. I got a little racing car about 1946 from Santa. There were no such things as toys during war years. The little toy car fulfilled all my hopes, my dreams I don’t know what became of it. I loved it even with its two wheels, it went when you pushed it – it could not go on its own. Q. If you were to take a prized possession form your home in Knockdoe what would it be? A. A silver teapot. The teapot was placed on a sideboard. When my father returned from the fair he would hand the money he got for his animals over to Mam. She in turn gave it to me and I placed the roll of notes in the teapot. When the family wanted to buy anything like a shovel, a spade or a hay rake the money was taken from the teapot. Q. Did you ever watch “Fr. Ted” and did you like it? A. I have watched Fr Ted on a few occasions. I was involved in the first programme of Fr Ted. The production team asked my permission to film in one of the churches in Carron, New Quay, Co. Clare. I gave them permission to film in the church at Noughaval, near Kilfenora. The Big House in the film is beside the sacred mountain of Mullaghmore. It is owned by the Mc Cormack family. Their children went to school in Carron. I was often in the Big House. Fr. Ted is not my favourite character. Q. What age were you when you left school? A. “Have I left school?” I hated school. I was 37 years roughly in school. I often ran away from school. I hated everything about it. Q. Why in your opinion are priests not allowed to marry? A. Too complicated to go into. I am happy as I am. Q. When you were young did you have any intention of becoming a priest? A. Yes I did. I think every boy of my age and my time thought about it too: some of the boys in school with me at the time say that they were sorry they didn’t give it a try. They would have made far better priests than I am. Lads like Frank Lawless and Cathal Nolan. Some of them were far more religious than I am. Q. Have you any goal for the rest of your life? A. To live as long as I can and to die happy when I can’t live. I hope to do the best I can for Oughterard. Q. What are your favourite foods? A. Steak, mushrooms and my mother’s apple tart. Q. Did you have a girlfriend? A. I have had lots of girlfriends all my life and I still have lots of girlfriends. Some of my best friends are girls. A. I studied. I did my lessons and said my prayers. I wasn’t good. I was often bold and got slapped. Q. Do you like being a priest? A. I enjoy it most times but, it has its ups and downs. I enjoy being here in the school with you now. I like meeting people. Q. Did you ever make a mistake in a Reading? Q. Do you like hearing Confessions? A. Not anymore. If you spend a half an hour now it is as much. Q. If you were not a priest what would you have been? A. An engineer or a doctor. I would prefer to be a doctor. Q. Do you like animals? A. Yes. I like dogs. I cannot take care of them so I can’t have them. Q. If you were told to choose the capital of Ireland, which town would it be? Q. Which soccer team do you support? A. I am not a soccer fan. Q. What do your brothers and sisters think about you being a priest? A. I think that they are very proud of me. I am very proud of them. In 1963 he was appointed as curate to Camus where he put a ‘blas’ on his gaeilge and acquired a fluency in the language with the help of the school children. When free education was introduced by the government in 1968 children from the Aran Islands attended St. Mary’s College. They had no English and Fr. Paddy taught them English through the medium of Irish. He became firm friends with Monsignor Malachy Hallinan when they began teaching at St. Mary’s College. Fr. Malachy had no car so he travelled with Fr. Paddy to matches and race meetings. They shared a love of both sports. Fr Paddy replaced Fr. Malachy in 1978 in Ennistymon. Monsignor Malachy said he was a close and trusted friend. He was a practical man who was capable of attending to the maintenance of buildings as well as looking after the welfare of his parishioners in his own quiet unassuming way. His favourite word (which he used frequently) was ‘creatúr’. He saw the human side of the person, he was never judgemental, never condemned but gave a person time to see the ‘Light’. Canon Paddy enjoyed peoples’ company, he listened with interest to their stories, their personal experience. He would seek advice and listen to other opinions. He considered matters carefully before making a final decision. Fr. Paddy appreciated the folklore of the parishes he served in. In Carron he enjoyed the music and the ‘seisúins’ associated with the musical culture of the area. Wherever he travelled he made friends for life. He kept in contact with friends. He had a very loving relationship with his own family, here in Ireland and in America. He treasured his frequent trips to America. During one of his visits to Boston he availed of the opportunity to reconnect with emigrants from Killannin, Oughterard and Connemara. They appreciated the time he spent with them bringing them tidings and good wishes from home. “On his appointment as P.P. to Oughterard Fr. Paddy had one task master to appease and that person was my long time angling colleague, Fr Frank Murphy. He believed that anyone appointed to such a renowned angling area as Oughterard should have an interest in angling or at least be able to fish. Believe you me he filled that criteria with distinction. Fr Paddy, Fr. Murphy and I ‘jelled’ together as angling buddies from that day on. 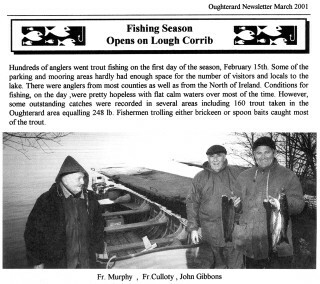 Fr Paddy loved his fishing and indeed many a time when fishing with Frank and I he told us of his fishing exploits off the coast of Clare sea fishing, fishing for salmon in Ennistymon and fishing for sea trout and ‘brownies’ in the rivers and lakes of Connemara. His appointment to Oughterard was like a dream come true in angling terms. Fr Paddy’s commitment to his duties as parish Priest made it difficult for him to fish as often as he would like. As Sunday was the main fishing day for Fr. Frank and I and that being the busiest day for Fr Paddy in the week we would have to make special arrangements to pick him up on the Glann shore after dinner many a Sunday. There was always great banter between them. Fr Frank told jokes and kept us both entertained as he fished. Indeed the same jokes were retold many times during the fishing season. Fr Paddy marvelled at the amount of clothes Fr Frank wore when fishing. One day he asked him why he wore so many layers of clothes. “Well when I am out here I like to be comfortable and not feel miserable with the cold. I can always take them off if I get too hot but I can’t put them on if I haven’t them with me.” So that answered that question. The high light for my two friends was the Clergy Fishing Competition. It was given special attention and careful planning went into it. Their goal was to beat the two Keogh brothers and that they achieved on many an occasion. Fr. Frank brought along treats for Fr. Paddy and I – his favourite being avocado, pears and prawns, a nice drop of special whisky for Fr. Paddy and I would get a Mars bar. Fr. Frank and Fr Paddy enjoyed their days fishing on the Corrib. They now lie side by side by the bank of the Owenriff River at the side of Kilcummin Church smiling down us all from above. The Galway Race meetings were always special events in his life where he met new friends and renewed old friendships. Ted Killeen from Ennistymon was his racing companion. They enjoyed placing many a bet and good social company afterwards. He was curate in Ennistymon at the time of the disappearance of the famous race horse Shergar. He claimed, with a twinkle in his eye, that he knew what happened to Shergar. He never revealed his secret. Like Shergar the mystery still lingers on and is buried with them. Canon Paddy retired as parish priest of Oughterard on September 19th 2008. After a concelebrated Mass a parish function was held in his honour in the Community Centre which was attended by a large crowd. 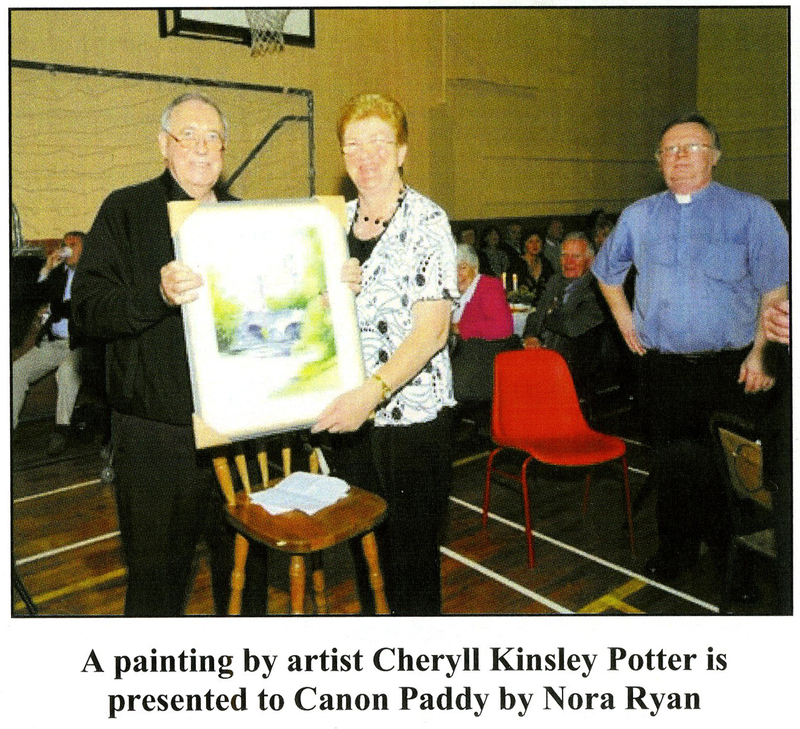 Nora Ryan, his loyal house keeper for thirteen years presented Canon Paddy with a painting by artist Cheryll Kinsley Potter. Canon Paddy spent his last years in retirement in Moycullen. He endured his illness with great patience. The solid friendships he formed in life served him well during this difficult period. His true friends never forgot him, his phone rang several times during the day – people concerned about his well being. 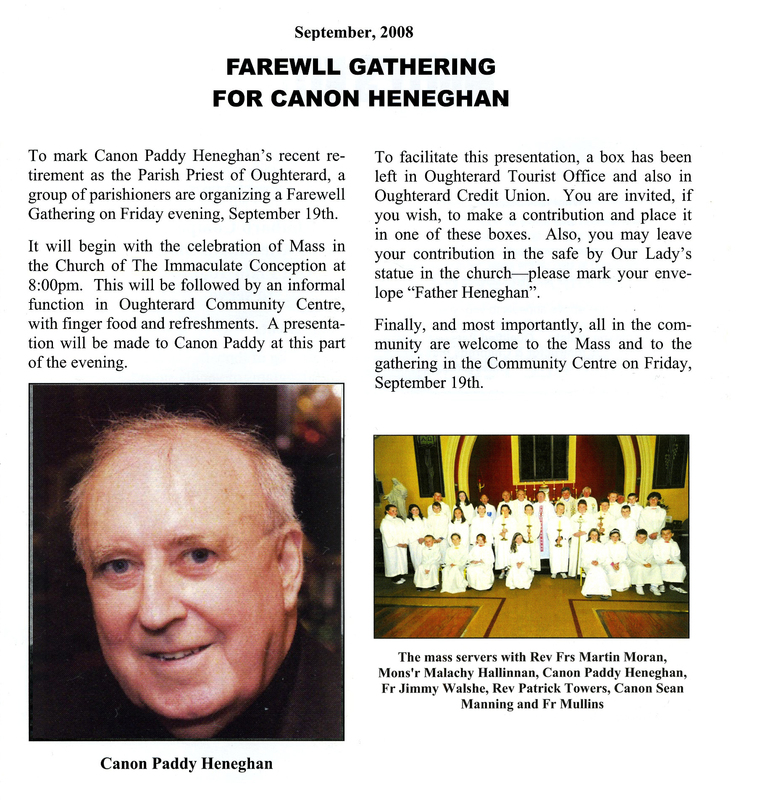 Canon Paddy left an indelible mark on all who had the privilege to have known him. May the good Lord reward him for his goodness. Death ends a life but relationships live on. The bonds of love can never be broken. For as long as we live we will remember Fr. Paddy. 1963: Ordained and appointed curate to Camus. 1968: Teacher at St. Mary’s College. 1991: Parish Priest Carron, Co. Clare. 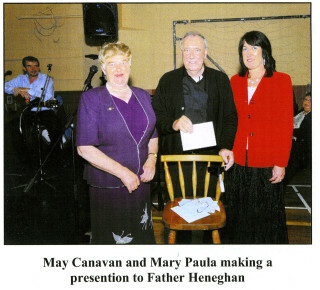 2008: Retired from parish duties. 2010: March 21st departed this life. This page was added on 06/02/2012. We have enjoyed reading about Father Henegan, who was kind enough to allow our family to search his records when we visited Oughterard, seeking our family roots. It was his day off, but he took time to chat to us, and was very kind. When we departed we insisted on giving him a small gift for his time…at first he refused the gift, but we insisted he accept, and we will never forget him waving us off saying…”and would a small bet on the horses be alright?” It was Galway Race week! God Bless Father Henegan!